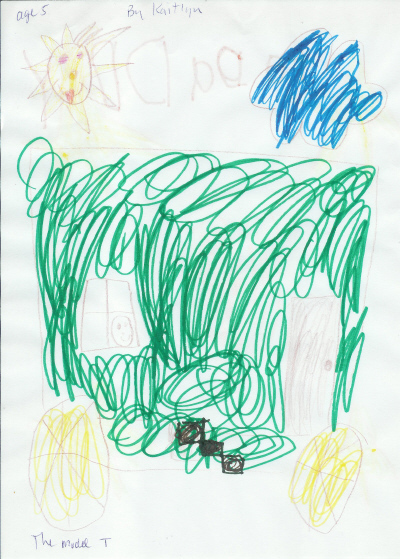 I was organizing a pile of papers this evening and came across a picture that my daughter drew for me this past spring - she was five at the time. It is a pic of her in my Model T. I thought I'd share it with you guys. The wire wheels give it away. Jackson Pollock's got nothing on her! I think Kaitlyn has captured the essence of our hobby! The smiling face beaming out of the back window says it all. Lucky, lucky, dad! One door on the passenger side so pre '26, she is sitting in the back so might be a rare Town Car? Obviously a Model T Ford due to the black oil leaks underneith. Keep this Jim and display it at her High School graduation with the car....I did something similar with my daughter who just graduated college ($$$$$). Our children grow up a little "different" with dads like us and they won't forget it. Actually, it's a 1927 Canadian Tudor. 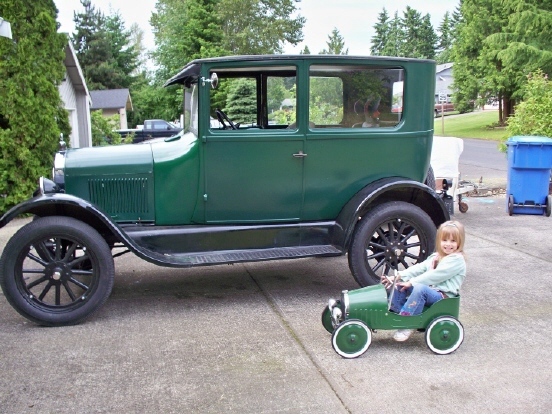 Here's a pic taken June, 2010 with my daughter in her Model T.
I love it! Congratulations! And Happy New Year!